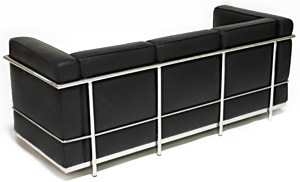 Le Corbusier, the great Swiss architect, created some of the world's most recognized classic modern furniture designs. Instantly recognizable, Our Corbusier Extra Grande collection constructed with exacting detail to the original design. Our LC3A extra grande sofa offers classy, contemporary, modern styling for the home or office at an unbelievable price. FULL LEATHER: Our Le Corbusier Extra Grande sofa is made with soft high grade Aniline Protected Italian leather, which provides you comfort and long lasting quality. The leather is hand-selected, expertly sewn and piped. We offer many choices of Italian soft and supple leather. 93"W x 29"D x 27"H: Seat height 14.5"